The term "curb appeal" makes me laugh when I think of my town. We have no curbs. We have no sidewalks. We have one stop light. This is home. Our home is at the end of a long driveway and it isn't clearly visible from the road. When I work on improving curb appeal I am working on the entrance to my driveway. 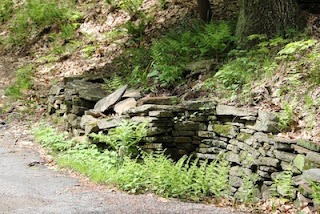 Soon after building our home (in 1978) I started building stonewalls because we are located on a significant hillside. The hill needed to be retained, we were young and ambitious, and we had no money but plenty of rock. 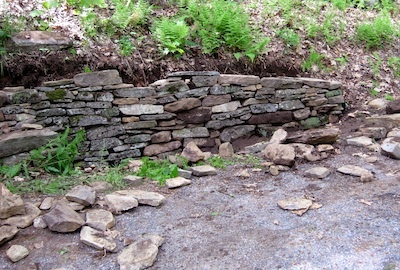 I taught myself how to build dry construction stonewalls. 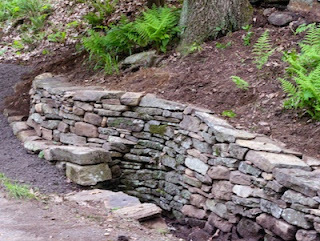 I built one stone wall that framed the culvert and retained the hillside at the beginning of our driveway. Unfortunately, I have had to rebuild it many times and had given up. 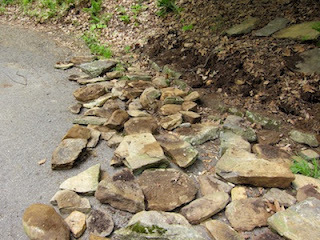 Unidentified vehicles have repeatedly "bumped" into my stone retaining wall leaving what had been puzzled together, in disarray. This is the "before" shot. It was in sad shape. This year David suggested instead of rebuilding it, let's resize it and replace most of it with pachysandra and ferns. It would repair itself when errant drivers felt a need to back into it. I thought that was a great idea. When the sun came out last weekend I started in. David assisted with demolition and digging - I hate to dig! It is such a challenge in this rocky New England soil. David doesn't like it either but he appreciates my stone walls so he digs for me! To a stone wall builder the following is a beautiful shot- a field of relatively flat stone, displayed in a single layer in position for building. All of these rocks came from the previous wall and many were imported to this site 30 years ago from my parents' and grandparents' homes several towns away. (They have beautiful flat rock there!) Although I do find and treasure some flat rocks here on our property most are what I would kindly call "free form" - not flat but not round either, certainly challenges. As we demolished it was clear that the project was going into high speed. Most of the entrance to our driveway was blocked by the stone. It is a goal in stone wall work to limit the number of times you have to move a rock. I needed to have this wall back together again by the end of the day or move the rocks out of the way. I decided to move the northern end back into the hill which is why David was digging for me. I still needed a stone wall at that end but felt if it was backed in further, it might be saved from bumps. This is the lunch break photo below. I kept working and by supper time I was one tired lady but the wall did snake its way around the big tree and curl back into the hillside right below the main collision zone. I had done a good job with rock estimation. 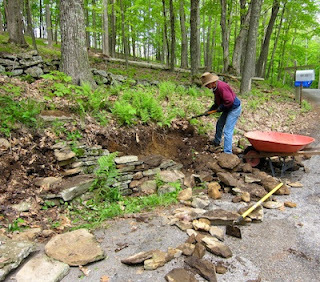 David did truck away a small load for another wall and brought in some processed aggregate for the base but then the rain returned. That was a good thing because my tired body needed a break! Our DIY project for this weekend was to finish the landscaping. 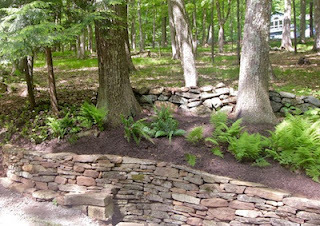 We transplanted many pachysandra plants and three Christmas Ferns plus brought in a load of dark cedar mulch. I worked carefully to allow the natural ferns already on the hillside to stay and flourish. This is the after shot. The pachysandra covers the hillside to the left and it will take a year or two to fill in and completely cover the hillside. We do know it does well here and the deer only eat it during a really tough winter. Job done! What's next? A Memorial Day Picnic of course! Enjoy yours. This is an impressive bit of work! Thanks for sharing your stories of creative hard work. Map Pillows • Where are you from?